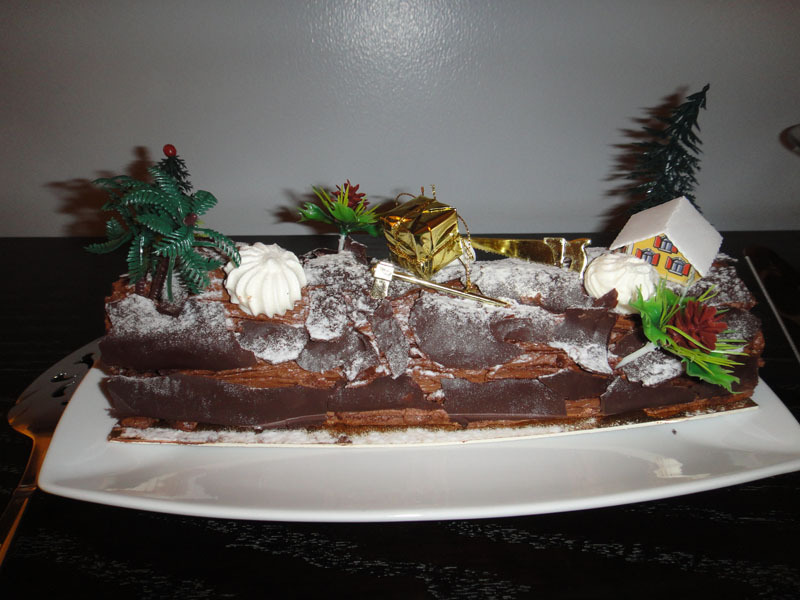 Bûche de Noël - the Yule Log cake my French Canadian friend brought for Christmas Eve. With so many nationalities in one place, nearly every month there is a National Day or a religious holiday. 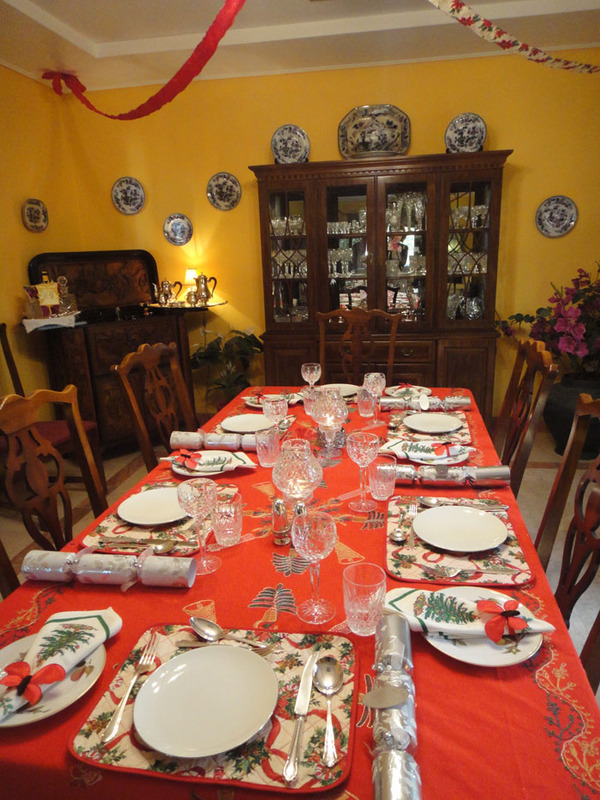 During the Christmas holidays our expatriate friends substitute for our blood family and the holidays become a whirlwind of festivities as everyone makes an effort to celebrate. And because wives cannot work, we have the time to plan parties. The eating fest started last Wednesday when my Irish friend hosted a ladies’ Christmas lunch complete with appetizers, soup, main course, pudding (English for dessert) and the final cheese plate. Every day since, it has been an amazing array of non-stop dinners, shopping, wrapping, hiding presents, decorating, cooking, and getting dressed up. Last night around 10pm after our Christmas Day dinner, I literally thought my stomach was going to pop. 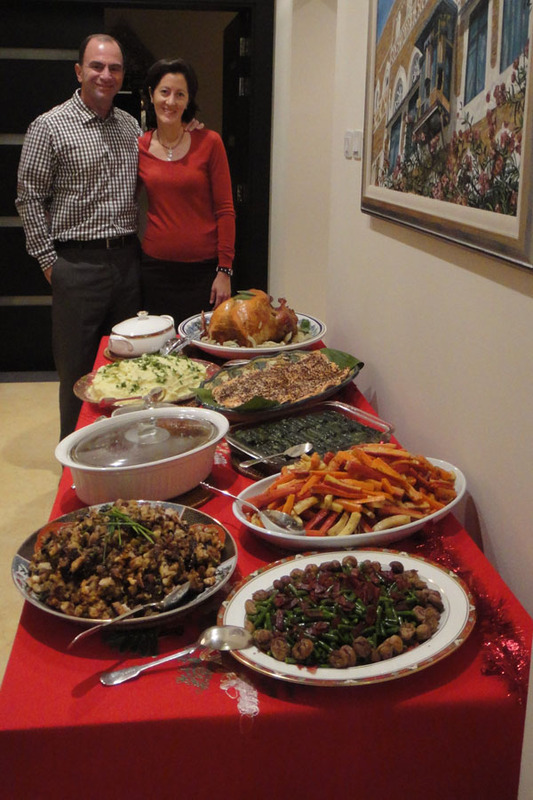 We had eaten three large meals in a row – Christmas Eve dinner, Christmas Day Brunch and Christmas Day Dinner. And today, December 26th, is Boxing Day. Almost every Western country but the USA celebrates something today. Yesterday a British lady told me Boxing Day was the day they threw out their old boxers to make room for their new clothes. Last night my American friend who was raised in London corrected that modern day interpretation. She said the day after Christmas the servants were given the day off to visit their friends and family. The leftover food was boxed up and taken for their celebrations. In the UK commonwealth, December 26th is a national holiday. Sporting events, like fox hunts, are held. It is also the day to visit the friends who you would have preferred celebrating with but could not because of family obligations. And like every other holiday in the US, Boxing Day has evolved into another shopping day as the stores start their sales. My Irish ancestors celebrated Saint Stephen’s Day on December 26th. St. Stephen was the first Christian martyr stoned to death by a mob for blasphemy. The story is traditionally boys stoned wrens on this day because a wren betrayed St. Stephen. In Sweden where my maternal ancestors came from, the 26th was the second of the twelve days of Christmas and a different St. Stephen was remembered. In old Sweden, horses were raced or drunken men sang carols while riding on horseback from village to village. This evening our British friends invited us over for a Boxing Day party. What I need to figure out in the next six hours is whether I should make a meat pie from the leftover turkey, borrow a horse and a guitar or just gather up our old underwear to distribute among the guests. Repent, Repent The END is Near – or is it? My Great Grandmother Helga Swanson. About age 15. I called her Morta-Mor, Swedish for grandmother. 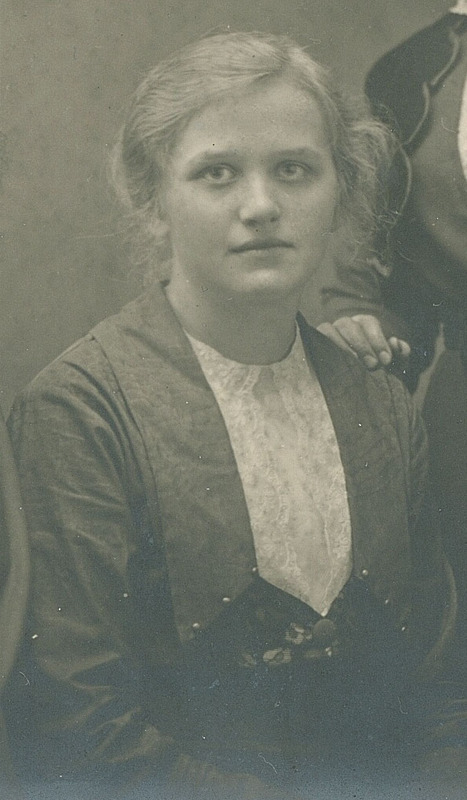 My great-grandmother Helga Anderson was an OX born in Ostergotland, Sweden in 1901. 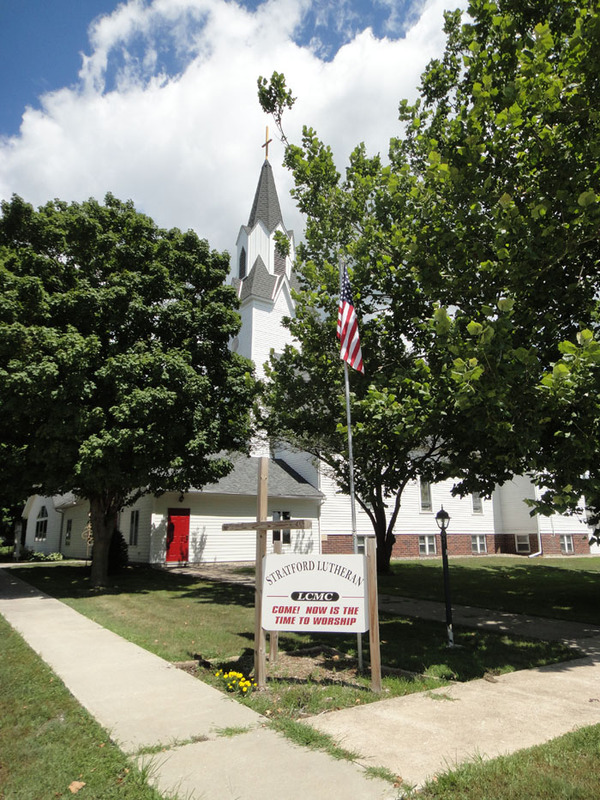 As the world was poised at the threshold of WWI, in the spring of 1914, she and her family immigrated to Stratford, Iowa. Without knowing a word of English and hoping to finish her education, she began school. Within a few months she saw her family needed support. She quit school, left her house and became a domestic for a neighboring farmer. As the war ended, 17-year old Helga became Axel Swanson’s wife legalizing her residency in the USA. A year later my grandmother was born. Her one regret was had she stayed in Sweden until she was fourteen she would have completed her confirmation studies in the Lutheran church. In the end she was confirmed in the Stratford Lutheran Church. She became a lifelong member. A hundred years later, emails about 11/11/11 and 2012 missives warning me we are dangling on the brink of THE END flood my inbox. I think of my grandmother, the farmer’s wife whose life experiences reflected her time and place, but whose words reveal her profound knowing. Thank you for the wisdom Morta-Mor. Where Did You Get That Pimple? From your Grandmother? 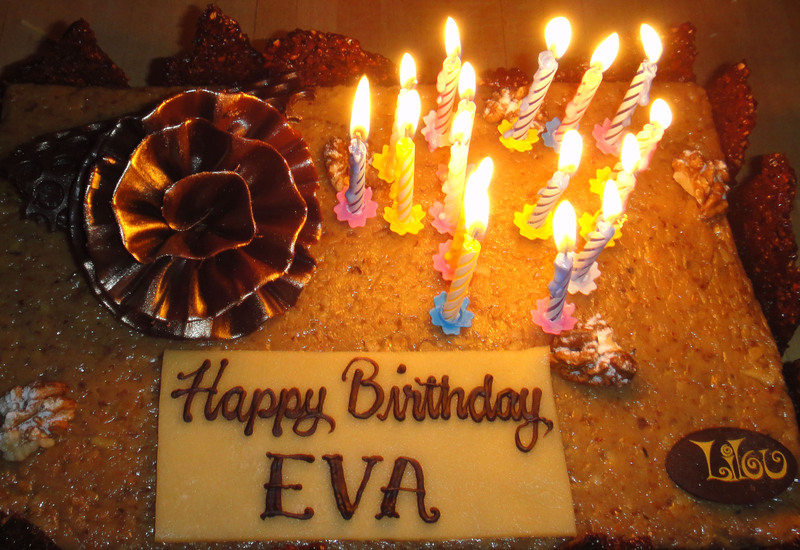 My birthday was celebrated in great style. Greetings from my family and friends, a massage, facial, presents, cake, flower bouquets and Dom Perignon. But to ensure that it was not 100% perfect, a tremendous pimple popped up in the middle of my cheek. I thought the twins would be great birthday presents. But they missed sharing my birthday by 2 hours and 20 minutes. The last month of my pregnancy, I was on labor prevention drugs so I had some control when I went into labor. On October 24th I was at 37 and a half weeks and I decided to stop taking the medication in the morning. By 7pm the contractions were strong enough to send me to the hospital. And there I waited and waited. I was disappointed when the clock hit midnight. Obviously my sons were not meant to be born October 24th. Instead they shared their October 25 birthday with my grandmother Naomi. Naomi died relatively young of a brain tumor which I believed stemmed from a deep hurt. I loved Naomi but I would not want my sons to harbor her deep resentment. Years later while reading through the family genealogy chart, I realized the boys also shared their birthday with my great grandfather Oscar. I found it to be an unusual coincidence. Oscar died before I was born but he suffered from mental illness, again something I hoped the boys would not share. Oscar’s wife, my great grandmother, was the daughter of twin sisters. These twin sisters lived to be in their 90s and remained close all their lives. Hmmm, a set of twins in the family, another small link to the past. The twin sisters were fifteen years old when they, their aged mother and 4 brothers migrated from Sweden in 1871. Two of the brothers, Andrew and John, changed their last name from Samuelson to Lindquist. Why didn’t they want to be known as Samuel’s son? No one had an answer. But I found another coincidence – Andrew Lindquist made it three ancestors who shared the October 25thbirthday. The Japanese believe if a soul suffered a trauma it develops a pimple. If a child is unhappy, then the Japanese say he has a pimple on his soul. Was the October 25th birthday the sign of a pimple? Was Mark’s unhappiness a trauma or a negative energy passed down through the family? Over the past two years I sought help from energy healers and I learned Reiki. Using Reiki, a Japanese healing system, the easiest way to deal with soul pimples is to find where the pain is because that is where the pimple is. I treated the entire family and kept asking Mark where is your pain? Of all three children Mark asked for Reiki the most. And I think today he is a happier child. He is lighter, less prone to anger. He has gained confidence and has taken initiative in several areas of his life. He demonstrates a lot of kindness towards his sister. I see a change in him. Is it just maturity? I can’t say. But I have learned healing takes time and whether another person is healed has nothing to do with me. I can only heal myself. So on my perfect birthday, to get a blemish and then have Mark comment on it seems to me to be a sign. There must be a pimple on my soul that needs healing. My birthday present to myself is the gift of knowing the years are passing and deciding it is time to re-energize myself and live more joyfully. I need to let go of any hidden past within me. I am a bit unsure what exactly needs healing but if I keep asking myself where is the pain? I am certain I will find out.